Larb (also spelled laap, larp, laab) is a type of Lao meat salad. It is most often made with chicken, beef, duck, turkey, pork or even fish, flavored with fish sauce and lime. The meat can be either raw or cooked; it is minced and mixed with chilli, mint and, optionally, assorted vegetables. Roughly ground toasted rice (kao kua) is also a very important component of the dish. The dish is served at room temperature and usually with a serving of sticky rice as is customary in Laos. A common variation is neu-ah nam tok, in which beef is cut into thin strips instead of using ground beef. Larb is the national dish of Laos and its popularity has spread to Northeastern Thailand, where the cuisine is heavily influenced by Laos. 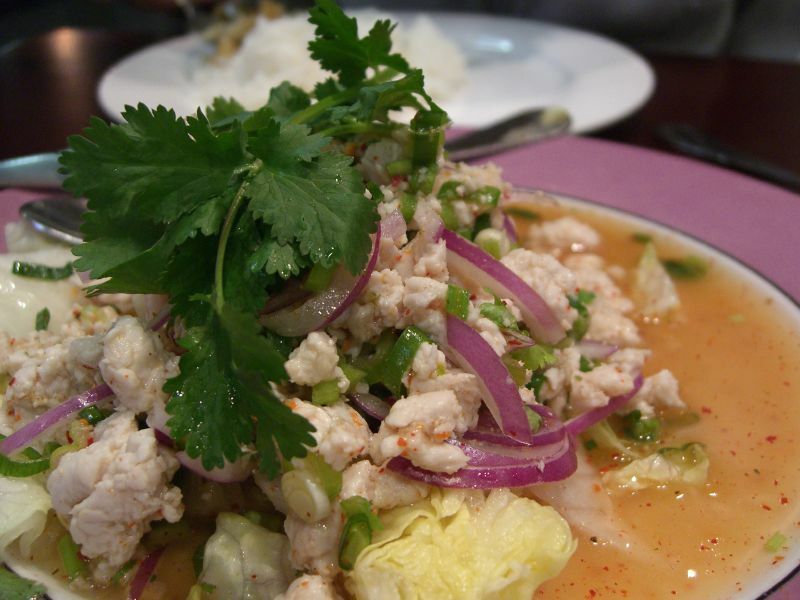 It is quite common to see this popular Lao meat salad served at Lao and Thai restaurants. There is also a variant from Northern Thailand which does not use lime or fish sauce, but rather other local condiments for flavor and seasoning. "Larb pla" is one kind of larb made of minced fish mixed with spices.